Did you know my southwest landscape images are used as the decorative art for a chain of restaurants called Sedona Taphouse? A few days ago, I made a trip to Fredericksburg, Virginia to replace the canvas prints that had been there for the last three years with all-new aluminum prints (a look the entire chain has gone to over the last year or so). I filmed the process of hanging the new artwork and have posted the video on my new YouTube channel. The video itself can be seen here. 6 of the 8 images hanging at the Sedona Taphouse restaraunt in Fredericksburg, Viginia. It is my intent to fill my channel with videos showing me in the course of making my images, exploring the thought process behind how I choose my subject matter, and the occasional videos highlighting some of the techniques I use in capturing my images. Feel free to check out the channel every so often, or subscribe to be kept up-to-date on when I post new videos. Oh, and if you happen to visit the Fredericksburg STH location, let me know what you think of the new art. 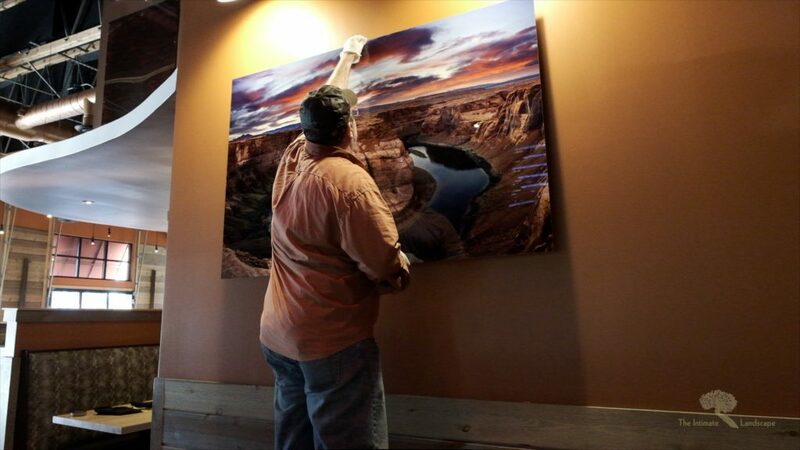 This entry was posted in Sedona Taphouse, Videos, YouTube and tagged Big Prints, Sedona Taphouse.